During the 1920s, Democrats often gathered at the Shriver family home in Westminister, Maryland for thoughtful and provocative discussions about politics and upcoming elections. 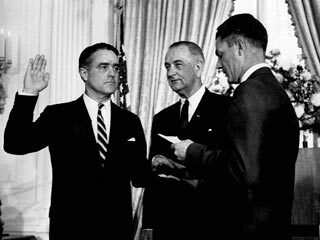 Ultimately, these conversations would go on to shape Sargent Shriver's life and his great interest in the affairs of state. While at Yale Law School, Sarge enlisted in the Navy. Upon graduation, he was assigned to the battleship South Dakota. Stationed in the South Pacific following the US' entrance into World War II, Sarge fought during the battle of Guadalcanal, receiving injuries for which he later received a Purple Heart. After rising to the rank of lieutenant during five years of duty, Sarge went to New York and then to Chicago, where he first became engaged in politics. In the 1950s, he chaired both the Catholic Interracial Council, an organization established to help desegregate schools, and the Chicago Board of Education. His activism gained both the attention and friendship of Mayor Richard Daley. After just two short years, he was courted to run for governor of Illinois. However, the Kennedy family asked him to forego the gubernatorial run and to assist his brother-in-law, John F. Kennedy's, on his presidential campaign. Sarge was quickly tasked with coordinating the Wisconsin and West Virginia primaries. Following Kennedy's election, Sarge was asked to direct the Talent Hunt committee, which would inform Kennedy's appointment of his top executive and ambassadorial positions. During Kennedy's presidency, Shriver would go on to lead the creation and implementation of the Peace Corps, which since its inception has sent more than 220,000 volunteers to work and build sustainable communities in 140 countries. In 1963, President Lyndon Johnson asked Shriver to serve as part of his administration by helping him launch his new War on Poverty. On August 20, 1964, Johnson signed the Office of Economic Opportunity (OEO) Act, which would eventually provide job training, work study programs, loans and grants to poor farmers, and a domestic volunteer service that cooperated with local governments and communities. Sarge became the agency's first director, building its many programs, including Head Start, Community Action, Volunteers in Service to America (VISTA), from the ground up. On May 7, 1968, Sarge took his diplomatic skills to France as its US Ambassador. Relations with France - and with French President Charles de Gaulle in particular - had grown increasingly strained before Sarge's arrival. President de Gaulle had established diplomatic relations with communist China in 1964, withdrawn from the North Atlantic Treaty Organization's (NATO) integrated military organization in 1966, publicly denounced the American war in Vietnam in 1967, and encouraged French-Canadian separatists in 1968. Meanwhile, the United States had consistently refused to aid France in its pursuit of becoming a nuclear power. The domestic situation in France proved to be difficult as well; upon his arrival in Paris, Sarge encountered a severe domestic crisis involving nationwide strikes and student unrest. Despite these challenges, Sarge and de Gaulle established a working friendship and Franco-American relations began to thaw. Upon his return from France in 1970, Sarge founded the Congressional Leadership for the Future (CLF). The CLF functioned as an independent organization separate from the Democratic National Committee, with Sarge serving as the Chairman. The CLF campaigned on behalf of Democratic candidates throughout the country for the November 1970 Congressional races. Sarge, along with his small staff, traveled extensively throughout the United States, delivering speeches, hosting luncheons and dinners, participating in local community events, and garnering support for candidates. In 1972 Sarge ran for vice president on the Democratic ticket along with presidential candidate George McGovern. The two lost the general election that November to incumbent President Richard Nixon and Spiro Agnew. Later, on September 20, 1975, after much encouragement by leaders within the Democratic Party and based on the current state of domestic and international affairs, Sarge announced his candidacy for President of the United States by opening his remarks with, "I could not stand aside ..." You can read his announcement of his candidacy here.